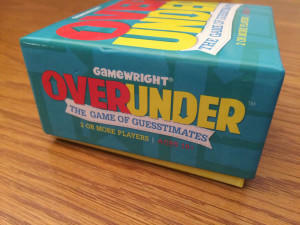 We review the party game Over/Under by Gamewright Games. In this easy to play game, two or more players compete and must answer questions and also decide how accurate they think the guesses are. When at a gathering of friends or family, I feel that some sort of numerical debate comes up with some regularity. These questions range from when a movie was released to the height of a famous building. I love having guesses thrown out by my friends, but what infuriates me is when people don’t check for the answer. A majority of us have a super computer in our pockets and why you wouldn’t use them to figure out the answer is beyond my comprehension. In the game we will be looking at today, we won’t be able to reach into our pockets for the answer because in Over/Under it’s all about guesstimates. 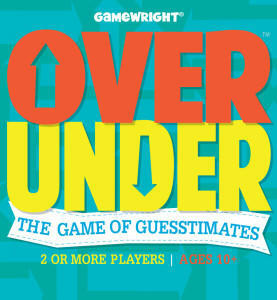 In Over/Under, players are trying to collect the most cards by guessing whether the group’s answer to a question is either over, under, or exactly the correct amount. Do you have a guess if this game will be worthy to add to your collection? Read on to find out. 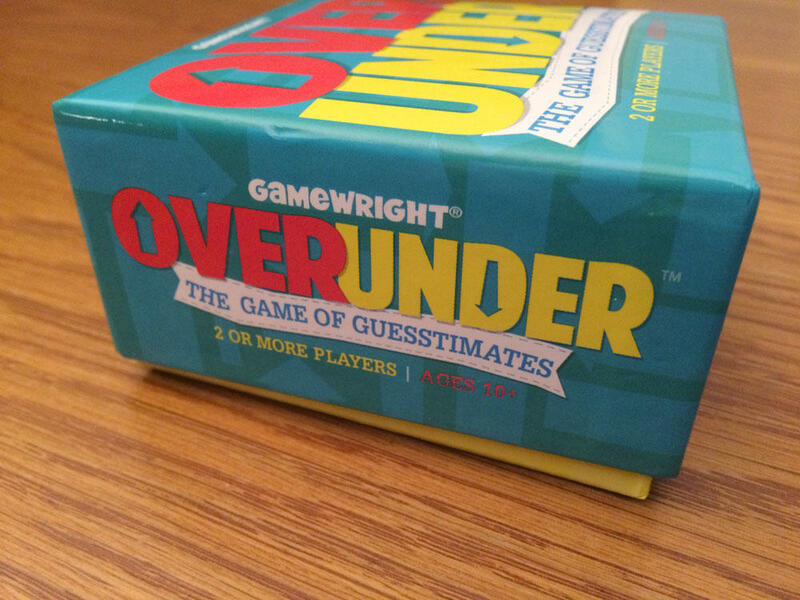 Over/Under is a card game for 2 or more players that you will complete in about 30 minutes. In my experience the game plays best with 2 to 4 players. At the start of the game, you will take 20-40 cards from the 200 included in the game to create the draw pile. Each card will have three different questions that all have a numerical answer. The person drawing the card will have to decide if the guess given by the rest of the players is either over, under, or exactly the right answer. If they are correct, they keep the card and the player with the most cards at the end of the game is the winner. 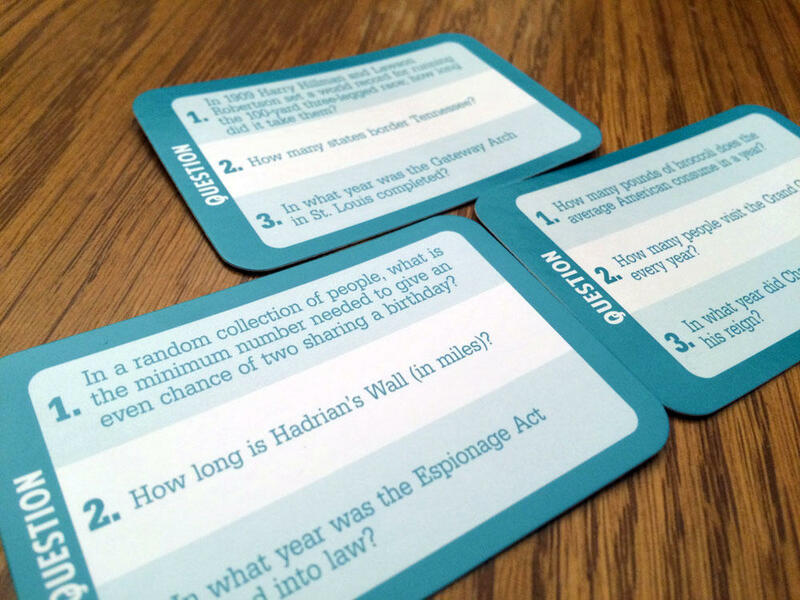 The variety of questions allows the game to be played by both adults and teens. There isn’t a lot in terms of components to this game. There are only the cards, the box, and a small rule book. The box is solid and the cards are made out of good card stock. Since you don’t have to shuffle the cards they will last a long time. While not a big deal, I wish the box would have the same magnetic closing clasp that other travel size games in Gamewright’s catalog have. It would ensure the box remains closed as you throw it into your gaming bag. 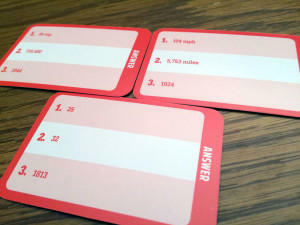 Each card has three questions for the player drawing the card to choose from when it’s their turn. Once they have read the question, the rest of the players decide together on what they think is the best guess. At that point, the player has to decide if they think it is over, under, or spot on. If they guess spot on and are correct, they gain the card and get to go again. If they correctly guess over or under they win the card but the turn is over. The stack of cards move to the next person and will continue until the deck of cards is empty. Whoever has the most cards at the end of the game wins. The game plays well with a few players, but once a larger group is tasked with giving an answer, the game falls apart quickly. My first time playing Over/Under was with my wife and we enjoyed it. I like how the game involves everyone during each player’s turn, rather than just when it is their turn to ask the group for an answer. In other traditional trivia games, you have to just sit there and wait until it is your turn to do something. This involvement keeps the game from dragging while you wait for your opportunity to read a question. I also appreciate trivia games that knowing the exact answer isn’t required to win the game. This allows for players of all skill levels of knowledge to play the game together. The questions have just the right amount of difficultly. 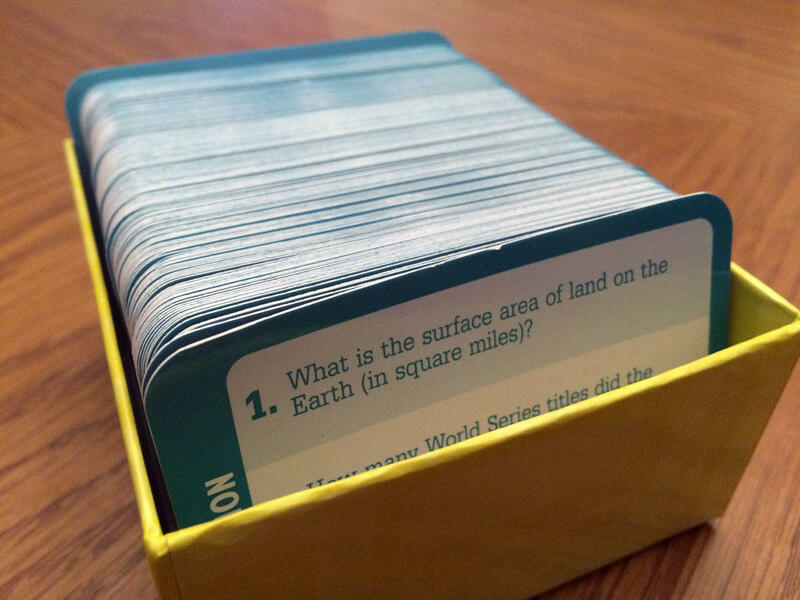 Speaking of questions, I found them to have more general knowledge questions than the obscure ones you might find in Wits and Wagers. I think that works best at this level of difficulty because if the questions were more on the obscure side, the guesses wouldn’t be close enough to warrant any contemplation. The game straddles the line of being too easy or difficult quite well. I found the over/under/spot on element to be more enjoyable than I thought. It makes the guessing a simple response for the person reading the question and a delicate process for the group to decide on what answer to give. Like I said before, the game was enjoyable for a trivia game when it was just my wife and I playing. Unfortunately the game experience changed once we added more players to the mix. The main crux the game is getting the answer by a group of people. I don’t know about your group of friends, but I find getting them to decide on where to go for dinner is difficult enough. The same thing happens when you try to get a number for the person reading the card to guess over/under. Some people will just not care, or two people will argue, or one person will give all the answers. I was hoping for a collaborative experience but it ended up falling apart. I believe the game would have been improved if it was the exact opposite of the rules. Where a player gives their answer and the rest of the group individually must decide if the answer is over/under/spot on. I will say that this game does have some value in your collection. The game is great to play with family and a good travel game. The game is easily transported in the small box and plays well in a group of 2-4 people. The game does come in a compact box which make it easy for transport, but I wish it was more secure. I do appreciate the attempt to find a new way to play a trivia game and Over/Under makes a good stab at it, but it just doesn’t work with larger groups. The collaborative experience falls apart quickly as you add more and more people to the game. However in small groups of 2 – 4 players, the game still has merit with a unique new way to play a trivia game. I found Over/Under to have some good ideas but it just doesn’t work as well as you would hope. If you’d like to pick up a copy of Over/Under, you can get it for about $12. 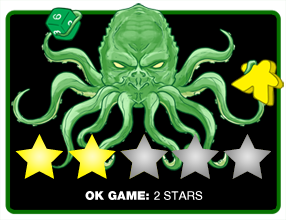 Final Score: 2 Stars – A new stab at a portable trivia game that works well playing with a few people, but falls apart quickly in a larger group.